www.watch-movies.net claims to be a completely legal service. It's free. It's easy to use and you get to watch real full length movies online. Just thought you might like to check it out. Nora has recently really decided she loves coloring. She burns through paper so fast that the walls, TV, doors, and garbage can all start looking like blank canvases to her. Then she found my oil pastels. So soft and rich. So colorful! I think she is in heaven. We have this large linoleum floor that is all black. The oil pastels stand out brilliant against the black. 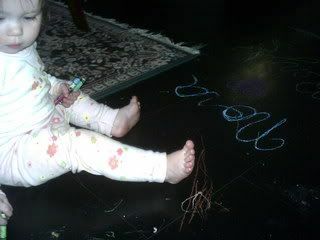 At first I scolded her for coloring on the floor, but then I realized...Why? Oil pastels are actually in some ways, easier to clean up that crayons! Sure, they get on clothes a LOT more than crayons. But instead of having to fight to get a hard wax off the walls or furniture, all I have to do to clean up after the oil pastels is use soap and water! 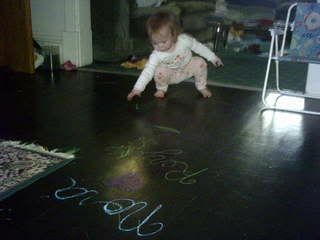 So I decided that Nora could color on the floor. There is no harm in it, it washes easily and I need to wash my floor every day or so anyway to keep the house looking reasonable. Want some pictures? I think they are adorable! Oraganic Cleaning and Potty Training. Potty Training. It seems to be the bane of most first time moms. Just hearing the word is intimidating. Sure, we know they won't go to school in diapers. So it will happen at some point. I really respect women who successfully do Elimination Communication with their kids. I know that is a huge time commitment. Nora is getting to the age where she is interested in the toilet, has pooped and peed in the potty enough to sort of have the idea. If she goes and sits on her potty chair, she will cheer for herself even if she doesn't do anything. It's so funny! One thing that I have found to be very effective is letting her drink a bit of warm water or herbal tea while sitting on the potty seat. If needed I let a little pour down her front. Having warm water flow seems to trigger her and I am hoping it helps her learn to release on the toilet. Of course, since we are trying to let her learn when she has to go, she is going without a diaper a lot. That leads to a lot of accidents on the carpet. Urine is of course one of those smells that we really just don't want to have our house smelling like. And the longer urine is around- the worse it smells! So simply dowse the accident in household white vinegar and mop up. If it is on carpet, you will want to blot as much of the urine up as possible, thoroughly dowse with the white vinegar, then continue to blot until dry. If you have a carpet shampooer, you can use the carpet shampooer to extract the urine. Then dowse the carpet with the vinegar and extract with shampooer. Some people do not like the smell of vinegar. Give it time. It will dry to a sweet smell. If you are still unhappy with the fragrance after about an hour, go ahead and rinse the carpet with water or your favorite carpet shampoo. There are some environmentally friendly carpet shampoos out there. I highly recommend you buy these for your shampooer. Our carpets are already one of the most toxic things in our house- no need to make them more so, right? Also, I ran across a tip on the internet a while back. If you get new carpet (you know the new carpet smell) it is recommended that you shampoo the carpet immediately as this supposedly helps reduce some of the initial out-gassing. I am not sure if subsequent shampooing through the life of your carpet continues to help with the out-gassing. I hope it does! I am going with the assumption that it does. If nothing else it is an easy way to remove a lot of soil from your house. I try to shampoo my carpets once a week. It doesn't always happen. I vacuum first to get as much of the dirt and loose stuff out of the carpet. I then shampoo. I am always shocked with how much soil I get out of the carpet. I always have some sort of sandy like sludge in the bottom of the water tank. I have a pretty decent vacuum. One of the old style Kirbys. I have seen that thing try to eat whole yards of cloth before I could stop it and I know it is has a lot of power. I have no doubt that a really modern vacuum like a Dyson would do even better, but until I can acquire a Dyson, I am going to do my duo of carpet care. And if the constant shampooing does help with out-gassing, I am all the more happy. Oh! One side note! If you shampoo your carpet this often, use less soap that is suggested by about 3/4 unless you have a specific stain that you are going after. Or alternatively you should rinse your carpet with hot hot hot water after every shampoo. Otherwise the soap residue will build up in your carpets and bond with your carpet fibers. This creates an almost sticky feel on your carpet and it will actually attract more dirt that it normally would! An occasional rinse with vinegar water will help as well. I finished the first of the pillowcases for the swap. It only had about an hour left on it for the past two weeks, but I kept forgetting to retrieve my handwork from the car! So this is one of the pillowcases for the swap, but I am not say which of my swap partners gets this set! I really had fun with this pattern. The flowers, stems and leaves are all in vine stitch and the ribbon below is in simple back stitch. I really want to learn more embroidery stitches. I know a few- satin stitch, back stitch, vine stitch, french knot....hmmm... I am sure I know more than that...but that is all that is coming to mind! Let me know what you think of the pillowcase!